Mission Statement: The mission of the forensic science program at Eastern Kentucky University is to provide a comprehensive science-based undergraduate education that enables students to become leaders in the forensic science community. Vision Statement: The Forensic Science Program at Eastern Kentucky University will inspire students to shape the future of the field using knowledge, skills, understanding and integrity. History: The program was started in 1974 in the College of Justice and Safety. At that time, the program had one main emphasis, forensic chemistry. Since this requires a strong science base and utilization of microscopes and instrumentation, in 1985, the program moved to the Department of Chemistry. The move to chemistry has been a positive for the program. Having a physical presence in a science department, gave the program a strong science basis and has also allowed sharing of instrumentation and other resources. With the development of DNA testing in the 1990’s, the program added a second option, forensic biology. In 2003, the program gained accreditation by the Forensic Science Education Programs Accreditation Commission (FEPAC) of the American Academy of Forensic Science (AAFS). In 2010, chemistry started the university’s first 3+2 graduate program that combines all bachelors degrees, including the B.S. Forensic Science degree, with the M.S. Chemistry degree. This has helped populate upper division chemistry courses and provided a supply of graduate teaching assistants for both chemistry and forensic laboratories. The move to the New Science Building in 2011 has also been a positive. Improved laboratory and classroom spaces specifically designed for forensic courses, again set the EKU forensic program apart from those offered by other universities. We have made it our mission to continually review and advance our program, guaranteeing that it stays in-line with current trends and methodologies of the industry. We employ a mix of academic and forensic practitioners which prepares students for successful employment. Our internship initiative, sourcing industrial placements for students within science-related organizations, is designed to maximize their ‘recruiting’ potential to prospective companies. In addition, we offer a capstone experience where senior students apply skills garnered throughout the program. Students process a ‘mock’ crime scene, from evidence collection to expert witness testimony. Our newly renovated crime scene house provides the perfect location to stage real- to-life scenes that brings together the student’s knowledge in an imaginative, exciting and challenging way. Why EKU? Being one of the oldest forensic science programs in the country we have a national reputation for excellence in undergraduate education in Forensic Science and are one of only 18 undergraduate programs in the U.S. that has received accreditation from the American Academy of Forensic Sciences. 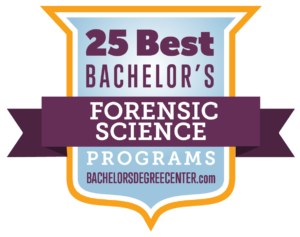 EKU's Forensic Science program has two options: Forensic Chemistry (FEPAC accredited) and Forensic Biology (currently working towards FEPAC accreditation).